Is ExpressVPN consistently fast and reliable? How well do the features and leak-protection settings work? Unlike with other review sites that merely focus on marketing claims, this ExpressVPN review is based on extensive, in-depth testing with all results posted below via screenshots. Specifically, I ran dozens of tests using ExpressVPN apps on all major operating systems to check for speeds, reliability, leaks, and whether all the features functioned as advertised. I tested the ExpressVPN apps on Windows, Mac OS, Android, and iOS for this review. For security, ExpressVPN is also among the best in the VPN industry. Their apps implement an advanced Network Lock kill switch, which will block all traffic in the event of a VPN connection interruption, thereby keeping your data safe and secure. 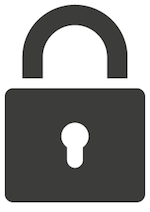 Network Lock works with your operating system firewall and keeps all data packets secure through the VPN. Unlike with other VPNs, ExpressVPN’s apps even protect users against leaks when switching network interfaces or going in and out of connectivity. The ExpressVPN apps I tested on Windows, Mac OS, Android, and iOS all worked flawlessly. In addition to being secure and reliable, the apps are also user-friendly and very well designed. The main drawback with ExpressVPN is the price. While they are currently offering a 49% discount, it remains a premium VPN service with an above-average price tag, especially for the monthly plan. But if you value speed, security, and reliability, then ExpressVPN is worth the money. ExpressVPN also limits you to three simultaneous connections per subscription, but you can use it with an unlimited number of devices. So unless you plan on surfing the internet with 4+ devices at the exact same time, then this isn’t much of a drawback. Furthermore, you can use ExpressVPN on your router to easily connect every device on your network to the VPN, with the router only counting as one connection. Based on these latest test results, ExpressVPN is currently the #1 VPN recommendation on the best VPN report. Let’s jump right into what most people want to know: how fast is ExpressVPN? To measure ExpressVPN’s speeds I ran numerous tests with ExpressVPN servers around the world. My physical location for all testing was Germany and my baseline internet download speed (without a VPN) was about 100 Mbps. All tests were conducted with ExpressVPN’s apps using 256-bit OpenVPN. The first round of speed testing was with ExpressVPN servers in Europe. With nearby servers in Europe I could consistently get around 90 to 95 Mbps, which nearly maxed out my baseline speed. For the first test, I went with a nearby server in Switzerland. Here is a test from a server in France. And another speed test in the Netherlands. And finally a speed test with a server in Milan, Italy, with the best result of them all. As you can see with nearby servers, ExpressVPN consistently performed at the upper limit of my internet provider (baseline) speed. This is a consistently fast VPN, especially when using nearby servers. If you are looking for the best speeds when using ExpressVPN, connecting to nearby servers, wherever you are located, will give you optimal results. I also ran a number of long-distance speed tests with servers in North America (from my location in Europe). Again, the speeds were excellent with all servers tested. Here I am testing an ExpressVPN server in New York. Here is another test with a server in Washington D.C.
ExpressVPN is one of the fastest VPNs I have tested. Based on these results, it appears to have earned its reputation as one of the fastest VPNs on the market. If you want a fast VPN that gives you the fastest speeds throughout the entire server network, ExpressVPN is arguably the best choice. You can also see on the ExpressVPN website that performance is one of their main focus areas. ExpressVPN is based in the British Virgin Islands (BVI). 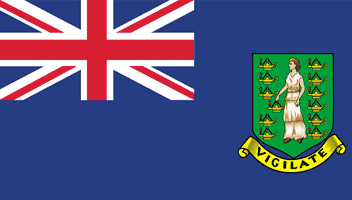 The British Virgin Islands are an independent, self-governing entity with strict laws protecting the privacy of businesses and individuals operating there. Unlike the UK, the BVI have no mandatory data retention laws or wide-scale surveillance programs, which affect UK VPN providers. Similar to Switzerland, the British Virgin Islands are well-known for staunch privacy protection and financial secrecy. Considering all these factors, ExpressVPN seems to be located in a good privacy jurisdiction, which is not part of the 5/9/14 Eyes surveillance alliances. These policies were confirmed when authorities in Turkey seized an ExpressVPN server but were unable to obtain any customer data. We will discuss this case further below in the VPN Logs section. Considering ExpressVPN’s jurisdiction in the British Virgin Islands and their privacy-focused policies, this appears to be an excellent VPN if you are serious about online anonymity and data security. ExpressVPN costs $6.67 per month if you use the discount coupon and select the 15-month plan. ExpressVPN has cordially offered reduced prices to Restore Privacy readers with the three-months free coupon. Without using the discount, the cheapest you can get ExpressVPN for is $8.32 per month. Above are the reduced ExpressVPN prices when you use the exclusive discount. When considering the price of a VPN, the key question is always value – what you get for your money. While many VPNs promise great performance, ExpressVPN is one of the few that actually delivers on speed and reliability. Two other areas where ExpressVPN outperforms most other services is with customer service and VPN apps. ExpressVPN offers 24/7 live chat support and a 30 day money-back guarantee (the best in the industry). The second factor is ExpressVPN’s apps which are user-friendly, stable, and very secure (see leak test results below). While ExpressVPN is on the higher end of the price spectrum, you typically get what you pay for with VPNs. ExpressVPN offers a large selection of VPN apps for different devices and platforms. This allows you to use ExpressVPN with nearly any device. ExpressVPN supports many devices and platforms. 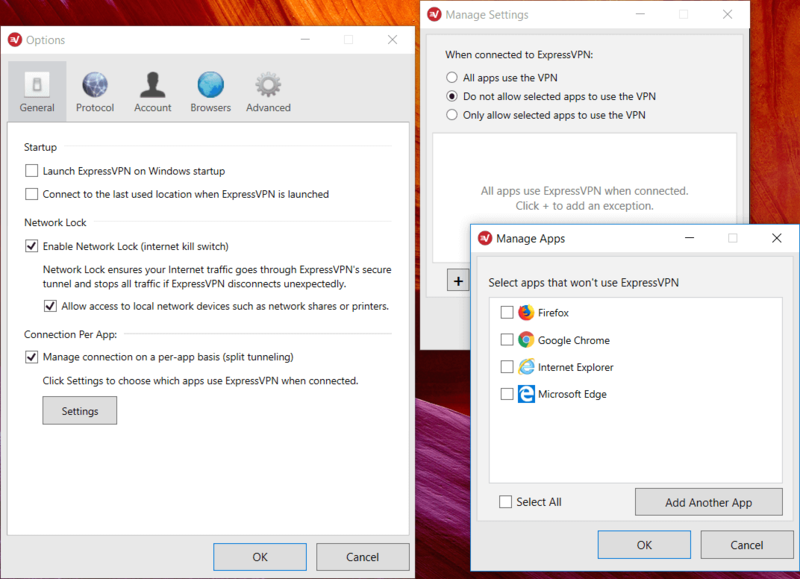 For this review, I tested the ExpressVPN apps on Windows, Mac OS, Android, and iOS (iPhone). Overall I found all of their apps to be well-designed, stable and also user-friendly. All of the ExpressVPN apps performed well in testing, without any crashes, bugs, or other problems. The ExpressVPN apps are reliable and user-friendly. You can install or configure ExpressVPN on as many devices as you like (i.e., computers, mobile devices, streaming media consoles and wireless routers). With one subscription, you’ll be able to connect up to 3 devices on any platform simultaneously. If you want to use more than three devices with the VPN, there is a simple solution: use ExpressVPN on your router. The router will count as only one connection and you’ll be able to use it with as many devices as you wish. Check out the VPN router guide for more info (not all routers work with VPNs). You can get more information on all the ExpressVPN apps and support for other devices on their website here. For encryption, ExpressVPN uses an AES 256-bit cipher with a 4096-bit RSA key and SHA-512 HMAC authentication. This is the highest level of encryption that is currently considered unbreakable, while also offering good performance. Additionally, ExpressVPN supports Perfect Forward Secrecy negotiated through Diffie-Hellman key exchange. Despite utilizing a very high standard of encryption (perhaps overkill), ExpressVPN still offers excellent speeds, as shown in the speed tests above. If you want more information on ExpressVPN’s encryption implementation, you can find that on their website. 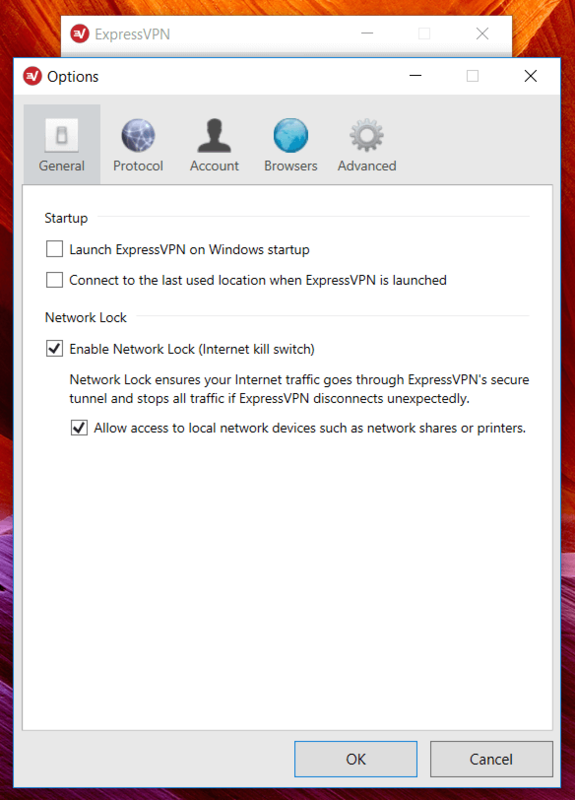 ExpressVPN refers to their kill switch as the Network Lock. The Network Lock feature will keep your data secure by blocking all traffic if the VPN connection drops. This ensures every data packet remains secured and encrypted, with your real IP address being protected at all times. The network lock feature worked well when I tested it out with Windows and Mac OS. All traffic was effectively blocked when I manually interrupted the VPN connection, blocking traffic, and then forcing the VPN to reconnect. When the VPN connection is interrupted, both the Windows and Mac OS apps provide a notification that Network Lock is active and no unencrypted traffic is getting through your operating system firewall. The kill switch (Network Lock) is a very important feature to keep your data secure in the event of a dropped connection. 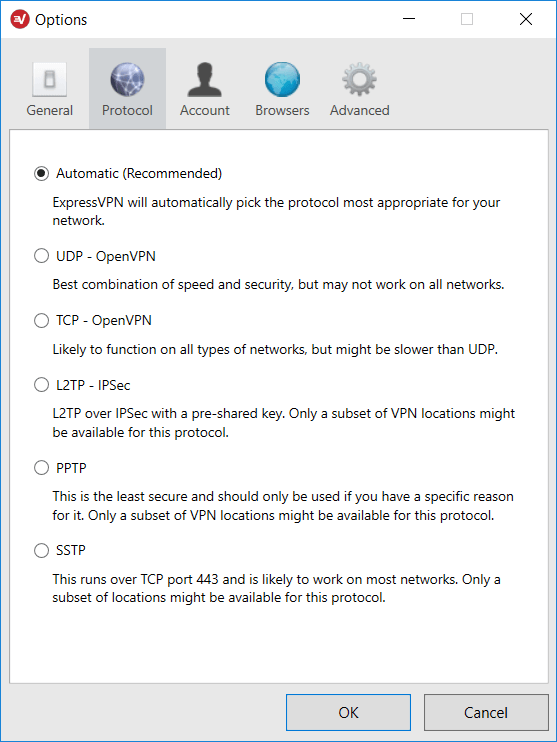 Most VPNs offer this feature, but in many cases it does not work well. For example with PureVPN, the kill switch does is broken, which results in traffic leaking out when the tunnel drops, thereby de-anonymizing the user. ExpressVPN’s apps do very well in protecting and securing user data. ExpressVPN offers a split tunneling feature with their applications for Windows, Mac OS, and routers. Split tunneling allows you to select which apps will go through the VPN tunnel and which can bypass the VPN to the regular (unencrypted) internet. ExpressVPN supports split tunneling on both Windows and Mac OS. The Mac OS split tunneling feature is basically the same as with Windows above. Many people want a split tunneling feature for various applications or use cases, such as streaming Netflix or with certain applications. 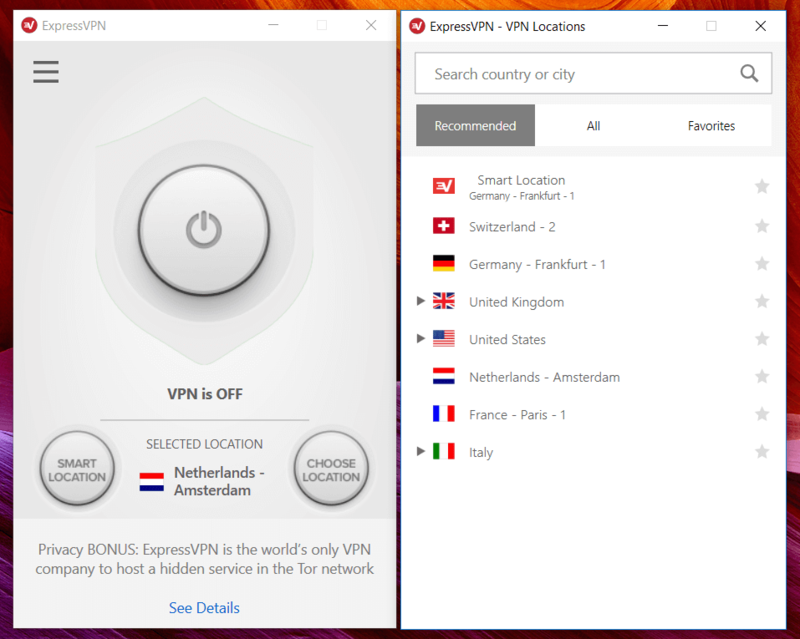 ExpressVPN is one of the few providers that offer this feature (and it works well). I ran the ExpressVPN Windows, Mac OS, Android, and iOS apps through some basic VPN tests to identify any issues/problems. The main testing site I used was ipleak.net. Results – ExpressVPN passed all tests. I did not identify any leaks, bugs, or problems with the ExpressVPN apps. Below are a few of the different testing results. 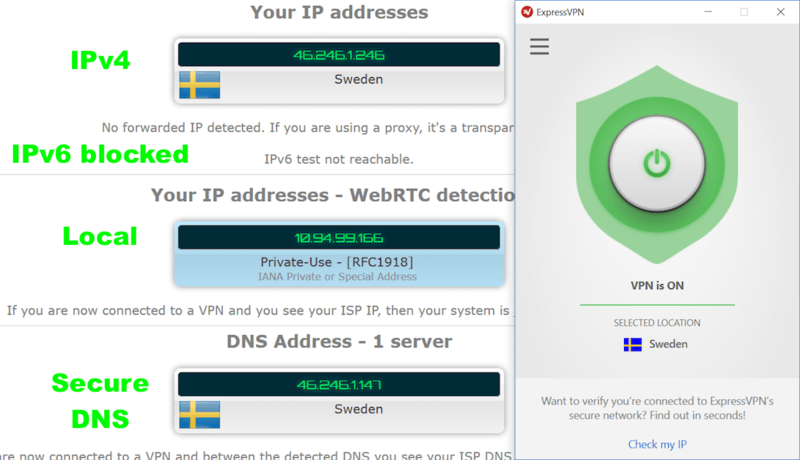 Here is a test with the ExpressVPN Windows client while connected to a server in Sweden. No leaks were found with the ExpressVPN Windows client. As you can see, ExpressVPN is securing all my traffic by providing me with an IPv4 address, blocking IPv6, and handling all my DNS requests with their secure DNS resolvers. (The address in the WebRTC box is local and not a leak.) ExpressVPN’s Windows app passed all tests (no leaks were found). Now moving on to the ExpressVPN Mac OS client, the results were the same: no leaks. No leaks were found with the ExpressVPN Mac OS client. Just like with the Windows app, the ExpressVPN Mac OS client performed well in all tests. Overall it remains one of the top recommendations for privacy and security-focused users. Many people who use a VPN for Kodi or a VPN for torrenting need a secure service that will keep their data safe. ExpressVPN would be a good choice based on these test results. Over the past several months, ExpressVPN has made several major improvements to its applications. While the apps still look the same, they are now hardened and secured to protect users against rare leak scenarios. Additional WebRTC leak protection – The WebRTC leak vulnerability pertains to the Firefox, Opera, Chrome, and Chromium-based browsers whereby your real IP address can be exposed. While this is technically a browser flaw that many VPNs won’t protect you against, ExpressVPN now implements advanced WebRTC leak protection in their apps. Additional DNS leak protection – ExpressVPN has also updated their applications to patch a rare DNS leak that may occur when switching network interfaces with an active VPN connection (such as switching from an ethernet cable to WiFi). Very few VPNs protect against this leak scenario. To identify problems with their VPN service, ExpressVPN developed a suite of privacy testing tools. They decided to make the leak testing tools completely free and open source – they can be used to test any VPN for failures (available on GitHub). We have carefully engineered our apps and VPN servers to categorically eliminate sensitive information. As a result, ExpressVPN can never be compelled to provide customer data that do not exist. This all sounds good, but how do you really know if ExpressVPN is taking these policies seriously? After all, we do know of VPNs that claim to have a “zero log policy” while logging customer data for US authorities – see PureVPN and IPVanish, for examples. The relevant issue here is that the authorities were not able to obtain any customer data – because there were no logs available. This case confirms ExpressVPN’s logging policies and overall commitment to securing customer data. ExpressVPN offers a great selection of servers around the world. They currently have more than 2,000 servers in 94 different countries. Europe and North America have the best coverage, but they also offer a good selection of servers in South America, Africa, the Middle East, and the Asia Pacific region. Check out the server page on the ExpressVPN website to see locations in your area. ExpressVPN also has a server status page showing exactly which servers are online and the available VPN protocols those servers support. Does ExpressVPN use virtual servers? ExpressVPN does offer a small number of virtual servers, comprising less than 3% of its network. Unlike other VPN providers that do not explain which servers are virtual location, ExpressVPN lists all virtual locations on their website and explained their reason for using them. (Note: A virtual server location is where the physical location of the server does not match the “virtual” location it broadcasts). Even though there are some drawbacks to “virtual” server locations, these are generally only used for remote geographic regions, such as Bhutan or Sri Lanka. Virtual locations are also used in countries where having physical servers may present a security risk, such as in Turkey following the server seizure case in 2017. Finally, ExpressVPN’s website explains that less than 3% of its network consists of virtual server locations. If you want to use IP addresses from remote regions of the world, ExpressVPN would be a good choice due to their large network of servers. 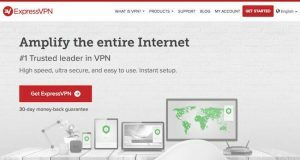 Does ExpressVPN offer static/dedicated IP addresses? No, ExpressVPN does not offer dedicated IP addresses. I tested out ExpressVPN’s support repeatedly for this review. In all my interactions, I found the support department to be prompt, knowledgeable, and polite. You can get access to 24/7 live chat support directly through their website in the bottom-right corner. With each chat session I initiated, I was connected to a representative in under a minute. Support with larger VPNs can often be hit or miss. With ExpressVPN, it seems to very good (as of the time of this review). ExpressVPN offers a browser extension for Chrome, Firefox, and Safari browser. The browser add-on is an extension of the ExpressVPN app, therefore you will need to be running the ExpressVPN Windows, Mac OS, or Linux desktop application. Why use the browser extension when you can use the desktop VPN app? The biggest advantage of using the browser app is convenience – i.e. the ability to easily switch server locations directly in your browser, rather than having to navigate to the desktop VPN client. Additionally, the ExpressVPN Chrome extension also incorporates HTTPS Everywhere – a great add-on that forces HTTPS connections – from the Electronic Frontier. Both ExpressVPN mobile apps I tested on Android and iOS performed well. ExpressVPN is one of the best options for both Android and iOS, allowing you to use the OpenVPN protocol and secure tunneling. Most VPN providers are limited with the VPN protocols they offer on mobile devices. This is especially true for iOS, where most VPNs only support the IPSec/IKEv2 protocol. ExpressVPN has fully-functional OpenVPN apps with secure 256-bit encryption for both Android and iOS (iPhone and iPads). With iOS, you can choose between OpenVPN and IPSec/IKEv2 protocols. The ExpressVPN Android app uses only the OpenVPN protocol. 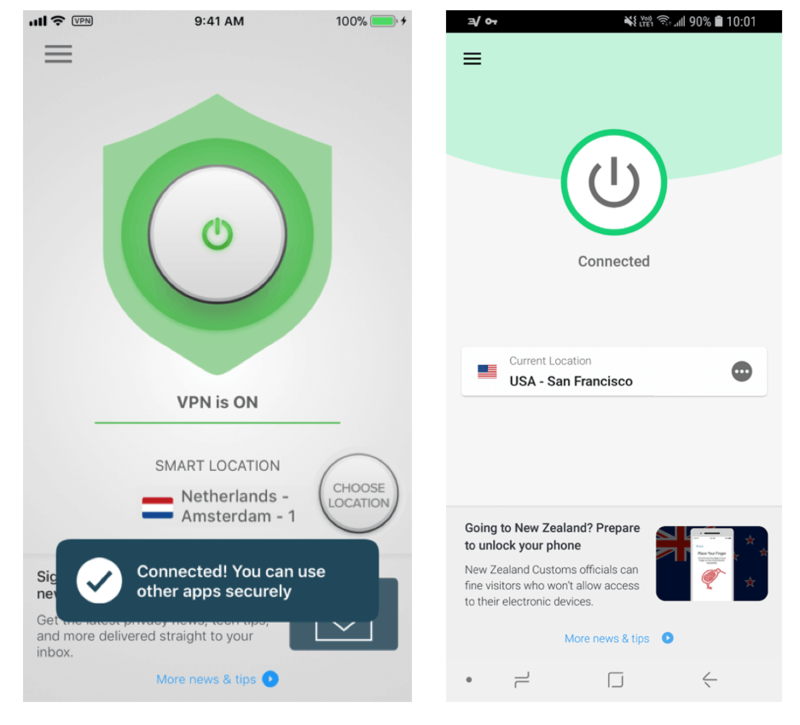 If you want to use a VPN on your mobile devices and tablets, ExpressVPN offers some of the best mobile apps you’ll find. Can you use ExpressVPN for torrenting? High-quality applications that will keep your data and anonymity secure while also protecting you against leaks and vulnerabilities (WebRTC). This, of course, also protects you from copyright trolls and DMCA notices. ExpressVPN is among the top recommendations in our VPN for torrenting guide. You can also get more information on the ExpressVPN torrenting page. Yes. ExpressVPN is one of the few VPN providers that continues to work with Netflix, no matter where you’re located in the world. 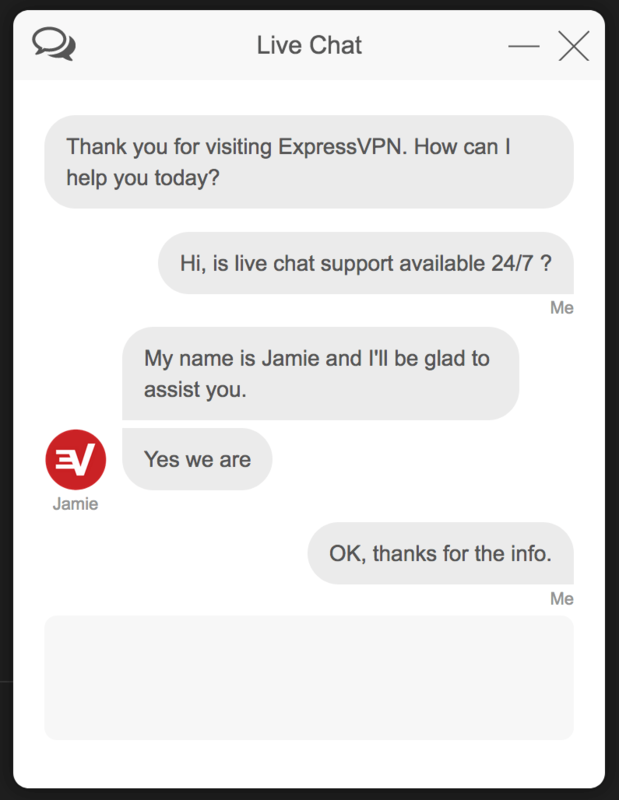 If you get any kind of proxy error with Netflix when you are connected to an ExpressVPN server, just contact ExpressVPN’s chat support and they’ll tell which server to use instead. ExpressVPN works very well with Netflix. 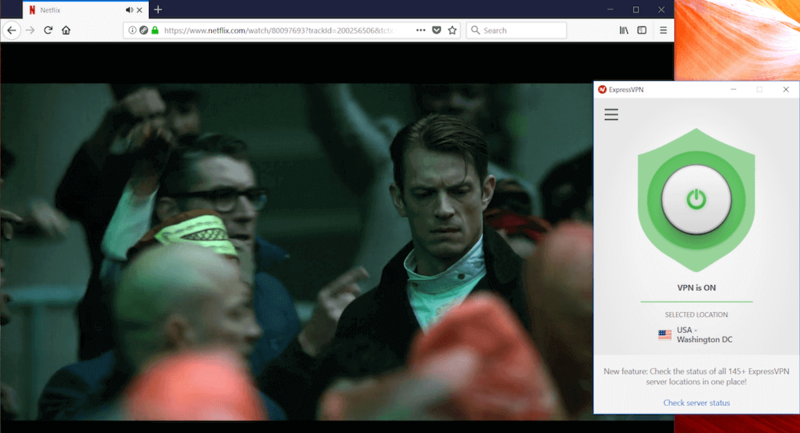 To use Netflix with ExpressVPN, simply start the ExpressVPN app on your device, connect to a server of your choice in the Netflix region you want to use, and then stream Netflix as normal. Check out the main Netflix VPN guide for more information. ExpressVPN’s performance for this latest review update has earned it a top spot in the best VPN service report. High-security applications with maximum encryption (passed all privacy/security tests) and the Network Lock feature to keep all data secure. Excellent offshore jurisdiction and company policies to protect customer data and user privacy (which were also verified with the server seizure in Turkey). Continues to work with Netflix and other streaming services. Huge selection of apps that are well-designed, reliable, and very user-friendly. There is very little not to like with ExpressVPN. It is a service that continues to improve and gets better over time. While the price has traditionally been on the higher end (at $8.32 per month) you can now get an exclusive discount to reduce the price down to $6.67 per month. Note: I also have a comparison guide for ExpressVPN vs NordVPN, as these are two of the most popular VPNs in the industry. If you have used ExpressVPN, feel free to share your honest review (good or bad) below. Do you think it’s a driver problem with the old Mac, or is ExpressVPN 7.1.1 buggy? Hi Nigel, I just checked the server status on the ExpressVPN website; every server in Europe is online (no network issues). I tested the ExpressVPN Mac client using a MacBook Air and did not have any issues with servers or connections. It may be an issue with using the older Mac and older operating system. Sice 3 weeks and up to date March 18,2019 ExpressVPN is not functioning anymore in China. Connection is unavailable or last few sec before going down. Company is trying to fix it (at least is what they are saying) but no solution till now. They are not going to give any reinbursement for people like me who purchased a yearly subscription. I will definitely dump them after 5 years. There has been a wide-scale clampdown on VPNs recently in China and I’m not sure which, if any, are getting through at the moment. You may want to try NordVPN or VPN.ac, although they might also be getting blocked in China now too. I am extremelly happy with ExpressVPN. The guys have insane speeds, compared to anyone else out there. I had signed up for Keep Solid before and the service was awful. The speeds were low, there were restrictions on most servers where you couldn’t use bittorrent trackers, the customer service was terrible. I live in a street where the ISP can only deliver 75mbps and with ExpressVPN I have a very small loss, which is not even noticeable. I am not particularly a torrent user but it’s nice to know that I can use it if I want to. And all this without any logs – which is great. Living in the UK makes anyone vulnerable and watchable by the government and I am not keen on allowing prying government eyes to watch me. I would recommend this service to anyone. It’s not that expensive and I think the prices they charge are totally fair. The only thing I disliked about them is the amount of devices connected at once. You can only have 3 devices connected at one time and if you have a family, this could mean that you either pay a little extra or you would leave some family members vulnerable. In my case, I have it set up in my router and that leaves me with two other devices available. I think they should raise this amount to 5 devices to make their product even more awesome. I signed up for NordVPN and ExpressVPN yesterday on their Cyber Monday deals. Unable to make a solid determination from all the reviews I researched on both providers I felt best solution was to get both, evaluate myself, then use the money-back-guarantee on the service to cancel one of them. NordVPN connection speeds were slow across the board by comparison to ExpressVPN. I concur with the speed tests listed here on restoreprivacy. My experience was the same. My baseline service is 175 down and 12 up. On NordVPN closest server cut that to 49 down and 3 up. ExpressVPN result was 152 down and 12 up. Other random tests on other country servers yielded similar results where ExpressVPN was faster not by a little, but by a whole lot. And I do mean really a lot. What's considered best speeds with ExpressVPN? I’m considering re-buying ExpressVPN after split tunneling refused to work properly with World of Warcraft. I couldn’t split tunnel and use the game at the same time. At the time it was a dealbreaker and I got a refund. I tried NordVPN and was hugely disappointed with the speeds, and after very extensive troubleshooting I got a refund from them as well. So the down speeds I was seeing with ExpressVPN were around 8 Mb/s or 80 Mbps. I pay my ISP for a 300 Mbps connection that’s always rock solid and very fast and tests above my paid-for rates. To take a hit of about 70% is quite disappointing. I’m trying to find out if this is just normal for a VPN. If the split tunneling actually worked correctly with ExpressVPN I’d be okay with it. I did VERY extensive troubleshooting on that “feature” also and there was no joy. I tried to work with their support several times and they couldn’t really help the matter at all. So IS 8-10 Mb/s the “norm” for VPN’s or what? I’d like some input from people who have been using it for awhile and who pay for greater than a 100 Mbps connection from their ISP. I’m not sure what’s going on with your speeds. As I posted in the screenshots above, I have a 100 Mbps line and can typically get around 90 Mbps with nearby servers. But you should definitely be able to get above 8-10 Mbps, unless your ISP is throttling VPN connections. One of few that has OpenVPN in its app! ExpressVPN is one of VERY, VERY FEW iOS apps that supports OpenVPN protocols (UDP/TCP) in its iOS app. Somehow, they got around Apple’s strict “no OpenVPN except through OpenVPN Connect” rule… which is great, because I find it actually works better with streaming services than IKEv2 and IPSec. It IS annoying that Apple blocks OpenVPN from VPN apps on the App Store and Mac App Store, but again, somehow ExpressVPN got around this, and I highly recommend them. This may be the case with most VPN services, I can’t say since this is my first for personal use. But while I’ve seen good numbers for ExpressVPN with slower connections, it’s worth noting that it doesn’t seem to scale for faster speeds. My fiber connection normally hovers around 950Mbps in both directions, but with the VPN, I’m lucky to hit 150Mbps each way on the server closest to me. It’s not a deal breaker, but it’s disappointing to lose 85% of my bandwidth when I’m using it. I think your reviews are the most accurate with regard to VPN services. However, I noticed that you really emphasized the importance of available bandwidth on VPN servers such as Perfect Privacy and VPN.AC which is what I use thanks to your review. I have used VPN.AC for a year now without any problems, however my account is up for renewal and I am thinking about changing to another VPN mainly for more locations, faster speeds and Netflix. Because you now rate Express VPN as the number 1 VPN I am considering using their services. However, Express VPN does not appear to show current server/node status which worries me. Also, in a previous review, you seemed to view negatively the fact that Express VPN used virtual servers which I agree with but now you seem to be OK with it! Express VPN may offer a good service but they are massively promoted via affiliate marketers (as most other mainstream VPNs are) which makes it quite hard to know if the service is really as good as they say! In an earlier review you had Perfect privacy as number 1, VPN.AC as number 2, VPN area as number 3, Zorrro VPN as number 4 and I think Express VPN as number 5. How is that Express VPN has now jumped to the number 1 spot as they have not changed that much? – They improved their network lock (kill switch) to add advanced leak protection measures, such as DNS and IP leak protection even when switching network interfaces, as well as adding WebRTC leak protection. – They added more servers and vastly improved speeds. – They clarified the virtual server location issue, what locations are virtual, and why they use these. – They had servers in Turkey seized, which makes them one of the few VPNs that have had their “no logs” claims put to the test. And in locations such as Turkey, where server security is an issue, they are using virtual locations, which I don’t see as a problem, given the circumstances and reasons for doing so. – They are one of the few VPNs that continues to work with Netflix and BBC iPlayer. – They lowered prices when you use this discount link (drops the price to $6.67/month). – General feedback I’ve gotten from other users has been very positive, more so than with other VPNs. Overall, ExpressVPN has made some major improvements and continues to be among the best I’ve tested. Über die Funktionalität der Router-Konfig, oder von VPN-Server, kann ich noch nichts sagen, weil ich mich erst in das Thema einarbeiten musste. Hier bieten Sie tolle, weitreichende Information und Hilfe zur Vorbereitung. Recht vielen Dank für die grossartige Arbeit! zur Info: spätestens seit September 2017, als das “BÜPF” angenommen wurde, werden jegliche Klicks, Aktivitäten und Verläufe im Internet auf Vorrat, direkt ab ISP, gespeichert. Gleiches via jeglicher Art von Telefonie und anderer Kommunikation. Dies der Grund für mein VPN-Interesse. Ich dachte, es könnte eventuell interessieren. Danke und Grüsse! No kill switch for iPhone or iPad. Only limitation I have found. Everything else is flawless. I’ve been using ExpressVPN for the past few weeks and so far haven’t had any issues. American Netflix works through the NY server, no connection problems, no interruptions, great speeds. Another thing I’ve noticed is that I’m not constantly getting RECAPTCHAS. I used PIA for the past two years but there were two problems I kept running into. First, outgoing emails get blocked. They said this was due to email spammers using their services. That means you have to disconnect your VPN everytime you want to send an email. PIA stands for Pain in the A$$. But the other problem was that I kept getting RECAPTCHA validations on websites. Some websites were even blocked. Long story short – I have not had any of these problems with Express at all – very glad I made the switch from PIA. The app is better and everything just works. I normally don’t respond to posts or comments online, but in this case I had to. While ExpressVPN is probably one of the best, if not the best VPN providers available for the consumer, customer service is somewhat unhelpful in regards to their client. Myself and friends who I referred to ExpressVPN all run Windows 7. For whatever reason, their VPN client does not play nice in a Windows 7 environment when you try to uninstall their client. Either one loses their internet connection completely and one has to troubleshoot through the device manager and do a System Restore or the wifi connectivity icon in the taskbar shows as disabled even though there is a connection. ExpressVPN support won’t address this issue which to me seems they know there is a problem, yet they don’t have a fix. I have tried other VPN clients such as IP Vanish, PIA, Nord, and Cyberghost just to name a few and I do not experience the issues that I get when I try to uninstall ExpressVPN. I was on chat with them for four hours and they gave up on me, litterally telling me to get help elsewhere. They just couldn’t figure it out. After following their instructions to uninstall their software something broke. It became not only impossible to either uninstall or install over their main app, but also I was and still am without an internet connection, so I can’t even update anything. Eventually they told me that even though Ubuntu was supported, Xubuntu was not!?!? I was quite polite throughout the chat so my attitude was not a factor. At the very end though, when the “expert support person” suggested I purchase a new modem, I told them I thought it was weird to break my system and suggest such a solution. Outside of this major problem and irritations with changing server location I found both their service and their support to be very good. Thank you for your efforts in reviewing the router and posting this article. I have been an avid user of ExpressVPN for the last 3-4 years and I must say that so far I have been very happy with them. I find their tech support or 24/7 chat team not just friendly and responsive but they also go out of their way to assist you with issues that may technically not be within their domain, although related. With regards to the Split-tunneling feature, this is also available in the ExpressVPN router app/Firmware (FW). It requires the device to be registered in the DHCP Server section under the Services > Services tab. Once this is done, click on “Let me select which devices should be protected” under the VPN > Manage Devices tab. This will allow you to select which devices should bypass the tunnel and which ones should go through. The caveat here is that the devices should be DHCP enabled and should not have a static IP. Lastly, I apologize for the redundancy if the above points have already been covered in the comments above as there were too many for me to read. Ive been using express vpn for a couple of years now and have tried a few of the others and i have to say these guys are the best by miles, the software works, customer service is instant and the speeds are as good as he says, i get 75% + of my 96mbit connection. I know i prob sound like an ad but every other vpn provider i have tried whick were all recommended by some bs article have been average to garbage. I just had a problem resolved with express vpn and i was so impressed i decided to write a reveiw. – Linux running on their VPN servers. – and no DNS leak prevention on unsupported Linux distros. Although we install and use GUI desktop environments on Linux. I’m not picking on ExpressVPN in particular. But on all who are doing this, except AirVPN (Eddie). They base their business model on free Linux and then as gratitude s..t all over Linux by not creating a GUI manager for connecting Linux clients. Although I love the command line (my IBM Power and IBM AS/400 background) there are certain things that I want quick, easy and fail-safe. A VPN service is one of them. And so do others in my household without too much command line experience, but with PC’s with GUI Linux desktops. AirVPN’s Eddie is available for other VPN providers of course. But it still contains AirVPN specific functionality. One aspect of these VPN packages not emphasized is that ExpressVPN uses very few CPU cycles. For example, looking in Task Manager Details, right now my System Idle process has 18 hours of CPU time, Crash Plan Service has 1 hour, and ExpressVPN has used 9 seconds in that time. One reason I switched from TunnelBear to ExpressVPN is that TB was using about the same time as Crash Plan spent backing up.